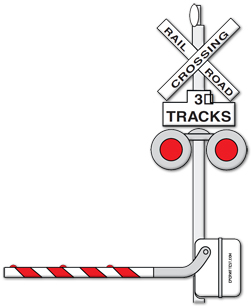 Gates are used with flashing light signals at some crossings. Stop when the lights begin to flash and before the gate lowers. Remain stopped until the gates are raised and the lights stop flashing. Do not attempt to drive around the lowered gate. Also, pedestrians may not cross railroad tracks when warned of a train by an automatic signal, crossing gates, flagman or law enforcement officer.